Remember the heavily customized Ohio Dakota we saw a couple weeks back? One of our readers photographed it a year ago, at an earlier stage in its development. 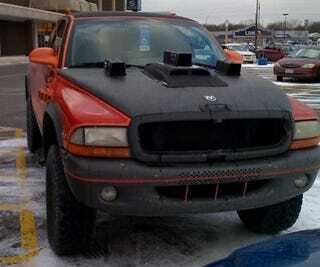 Halloween Hood Scoop Overload: Ohio Dakota! Interestingly enough, I strongly believe that this was the same truck exactly 1 year ago. I was in the same area, and it was parked in a mall parking lot, and I couldnt resist taking a snapshot.... I just cant believe how far it's gone in a year. ... Hideous.